Those aren't lottery numbers, they're the high temperatures recorded in my neck of the woods over the past six days. At Nashville airport, it actually hit 109 degrees (42.8 celsius) on June 29, setting an all-time high temperature record. That's right, the highest temperature ever recorded in Nashville since modern record-keeping began back in 1871, over 140 years ago. Oh and did I mention we have had basically no rain for over a month? What does that do to a garden? It ain't pretty, folks. I'll spare you pics of the worst of the carnage today and just say that I'm fighting to keep most plants alive. At the same time, I'm perversely interested to see what will survive. Especially in an age of scarce resources, I believe that coddle our gardens far too much. I think I want a garden that can prosper - or at least survive - with little intervention or assistance. In any case, I have not been living up to that ideal, but I have taken feeble steps in that direction by refraining from watering every day and limiting my watering to every other day. I had thought perennial geraniums like Rozanne were drought-tolerant, but as with my last post, I find that when I go back to look at the Bluestone Perennials plant description, I must have actually focused on heat tolerance rather than drought tolerance. That's a big difference. Rozanne might do great in steamy tropical wet Florida -- or even in a normal Tennessee summer punctuated by regular downpours -- but it doesn't seem to have much tolerance when the rains fail. In any case, I tried cutting back the dead growth on my three Rozannes. 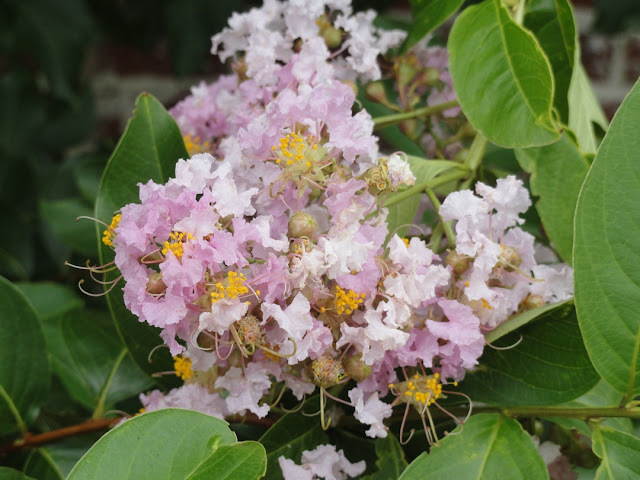 (I was guided in part by this article that suggests a big cutback can promote rebloom, though I'd be happy with just having them survive to bloom next year.) As a relatively novice gardener, I'm not sure if that was a good idea or not. Would more experienced gardeners like to chime in? 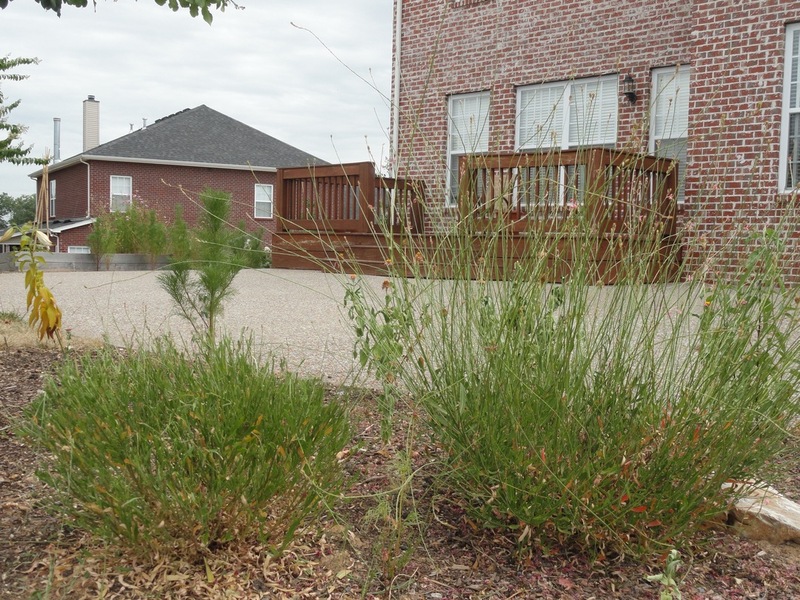 Do you typically cut back drought-stressed perennials. Since I was in a trimming mood, I also cut back two of the three gauras. 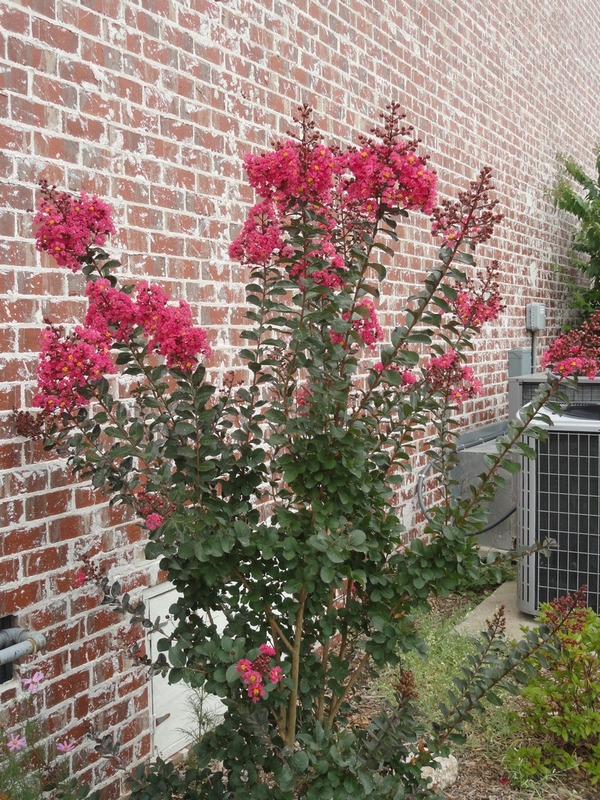 Again, I was guided by an article that said: "If the plants are looking tired prune again in summer to encourage a further flush of flowers." But what is the best way to trim a wild and sprawling gaura that has ceased flowering? 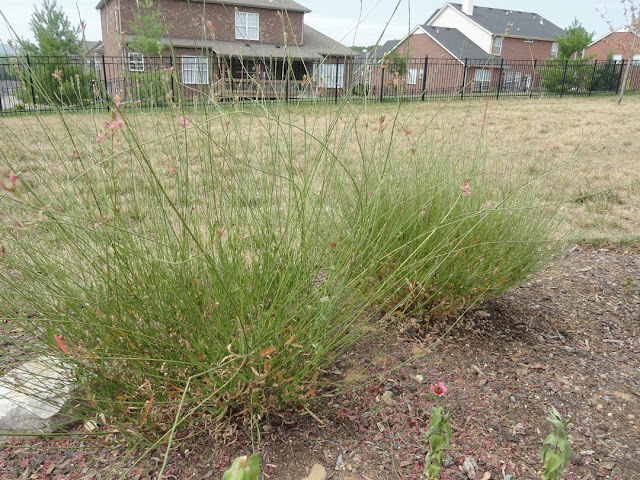 1) For the plant on the right, I grabbed bundles of the long floppy stems and cut them back close to where the leafy bottom part of the gaura begins, maybe 8-inches off the ground. 2) Cutting bundles of stems is hard work, so for the plant on the left, I tried to cut back even further. I mostly chopped this plant back to its woody stems. One cut to a woody stem severs all the floppy ones above it, so fewer total cuts are needed. But I'm a bit concerned that I may have cut back the plant too severely. There were a lot of dead leaves at the base of both plants, particularly the one on the left. I'm not sure if this is typical (it's only my 2nd year growing gaura and I know they are supposed to be short-lived plants), but I suspect that it's at least partly the result of the heat and the drought. 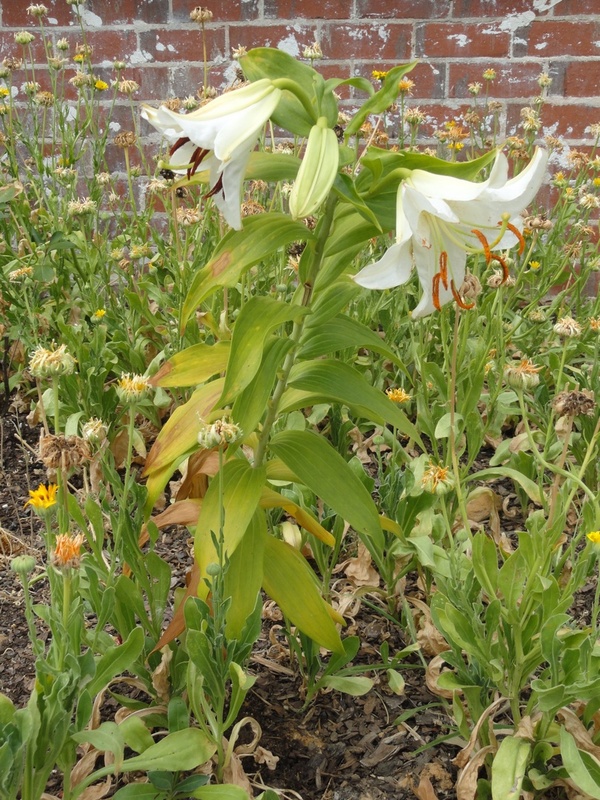 With the trimming done, I took a walk around and visited some other plants, like this heat-and-drought stressed lily. I can't remember the name of these lilies we planted last year, but all three of them did come back and they were looking pretty good until about two or three weeks ago when they started yellowing at the base. Not all the flowers have opened and the ones that did open weren't looking all that happy. 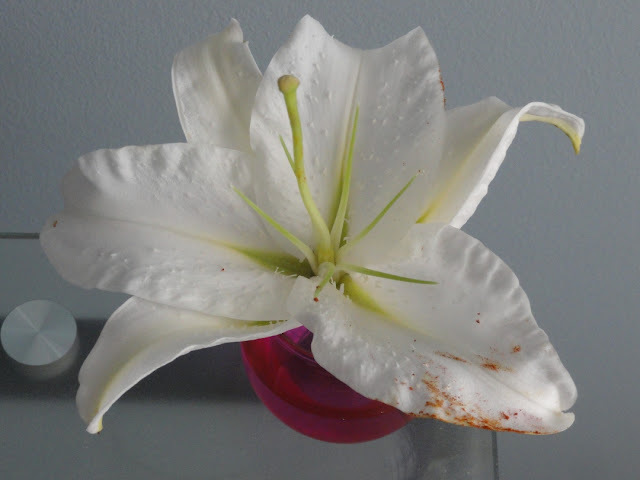 So I cut some of the flowers and brought them inside where we could enjoy the beautiful fragrance. The ones that are inside in the a/c and sitting in a vase of water look much happier now! Lily struggling in the heat. Finally, let's take a walk around to the North side of the house. 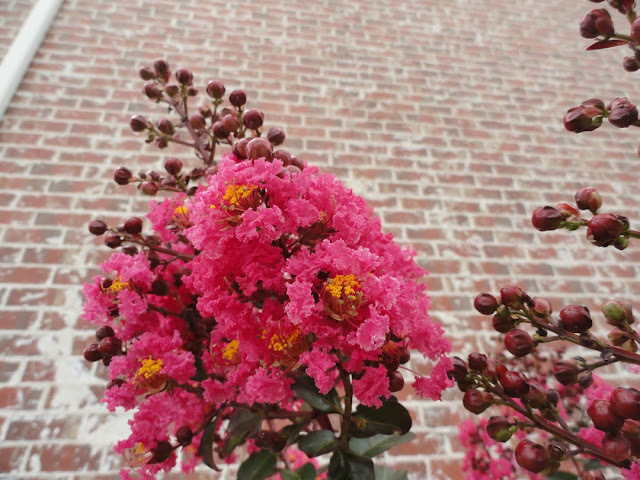 It's a bit cooler and shadier over here, which means that while several of the Natchez crape myrtles sitting in direct sun on the west side of the house have stopped flowering and are sulking with drooping leaves, the ones on the North side of the house are looking much fresher and just starting to cover themselves with flowers. It's a welcome sight from an aesthetic standpoint, and I'm guessing that the bees are happy as well. That's all for now. Weather.com is calling for a 95% chance of rain in the next six hours. Accuweather says 90% probability of rain. I hope they are right! Conversation starter --- Do you pamper your garden with life-sustaining water in times of drought or do you practice tough love and create your own little Darwinian survival-of-the-toughest situation? I can think of lots of things to do with Toy poodles before putting them in the Amazon... I pick your post but feel your pain, we have been having rather mild summer weather in Boston. I don't pamper too much with water, but I don't always wait for wilting to water. With super hot weather I just try to keep things alive until fall. During that weather, I will water in the evening so they have the evening to recover and replenish. I'm hoping for rain for you. Oh boy, those temps are pretty bad, we've been a few degrees less that you, but still not a drop of rain. I keep my sanity by being thankful we have power, most of my city (and state) lost power last Friday night, and many folks still don't have any. It's another bad summer, and I hear Great Britain has had all time record rainfall and cool temps. Also, I read folks should water tomatoes less once fruit sets, it's supposed to make them sweeter, so maybe a little drought will be good for them, just trying to stay positive. Aaron, I confess that I water as necessary, because for me it's not just the plants I'm taking care of, it's the critters that depend on those plants. Fortunately, as our plantings have gotten denser, they need less water, because the leaves of one shade the roots of the next. We also mulch pretty consistently -- helps to retain moisture--just not right next to the stem of the plants. Mostly, we end up watering just those plants in the hot spots in the yard. Good thing, since we're on city water! Our highs have been between 95 and 100 with a break predicted for Saturday. I normally am a non-coddler but I have been watering pretty steadily: flowers twice a week, vegetables every other day. I have a lot of flower beds and use soaker hoses so it's kind of a pain. However, I look at your pics and realize I should really count my blessings. Hang in there! We're supposed to hit 106 on Saturday. :( Here are a few suggestions: Lay soaker hoses at the base of your plants and cover them with a couple of inches of shredded wood mulch. I noticed your garden wasn't mulched, which contributes to moisture loss in the soil. When I lived in SC and was gardening in sandy soil, we mulched with pine straw, but wood mulch will hold more moisture. Soaker hoses are the most effective way to water because the moisture goes right to the roots instead of just getting the mulch wet. Running the sprinkler is only helpful for grass, which is shallow rooted. I water like a fiend. 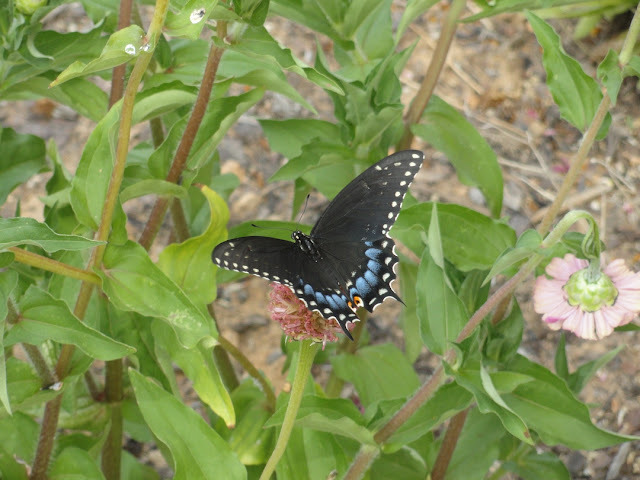 I've incorporated as many drought tolerant plants as possible into my garden, but I also have plants, like monarda and joe pye weed, that like to be moist. 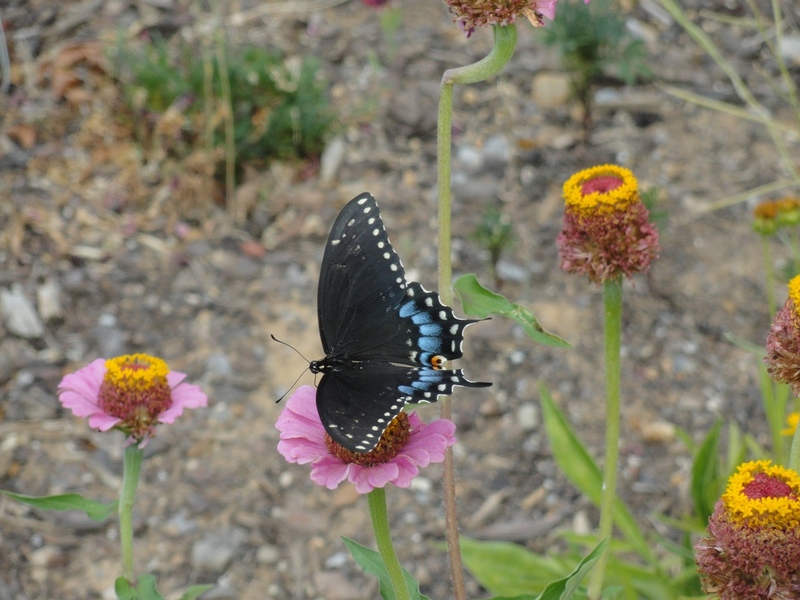 Not watering them would kill them, harming the pollinators that depend on them. I also have five rain barrels and recycle as much household water as possible, especially cooking water. 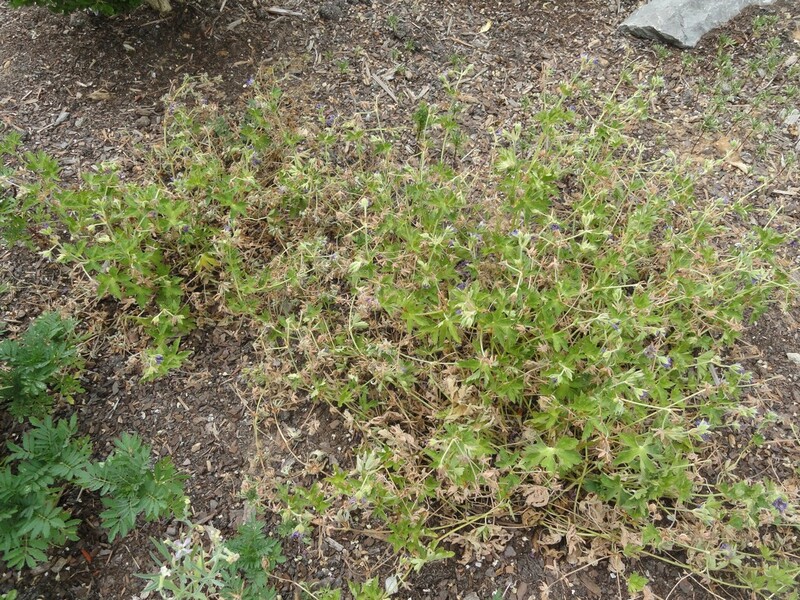 Cutting back plants does help them in times of heat/drought stress, but don't cut them back too much because their ability to pump out new growth right now is compromised. Deadheading and cutting back by a 1/3 is helpful. Adding 1/4 cup of Epsom salts and a tbsp of liquid kelp per gallon of water to your watering can will help your plants resist environmental stress. Make sure you give the salts, which aren't really salt, a chance to dissolve before you pour the liquid out. I usually just stick my hand in the jug and stir them a bit. :o) Reapply every two weeks. @Reed - What *would* you do with a toy poodle? ;-) I may adopt your evening watering strategy. I know some gardeners frown on evening watering because of the risk of fungal diseases, but it's so dry that I can't imagine the fungal risk is that high. Plus when I water during the day, even in the early morning hours, I'm worried that the water is evaporating before having a chance to really soak in and let the plant recover from the day's heat. @Julie - Thanks for the pep talk on the tomatoes. With a bit of water every couple of days, they seem to be handling the heat fine for now (at least the Sun Golds and the Riesentraube). Of course, they also get morning shade, which I think helps somewhat. And yes, I am very grateful to have power and A/C!! @RK Young - I need to get to the point where plant density gives the roots some shade! Not anywhere close to that yet. And I totally understand about feeling like you need to keep plants alive to keep critters alive. The only reason I'm not giving up on plants like the zinnia and the cosmos completely is because the butterflies, bees and gold finches are swarming them. @Jason - I hear you! Extraordinary times call for a little extra coddling! And yes, I wish we had temps that *only* hit 95! Well, we're supposed to finally get a break in the heat wave by Sunday. Fervently hoping the forecasters are right for once. Aaron, we were in Nashville moving our daughter into her new rental....yes it was stinkin' hot! Hopefully we all will get a break in the weather soon. I have Gaura that I trimmed similarly to the one on the left. (hard prune) and it seems to be pretty happy. Hope yours responds with this heat. 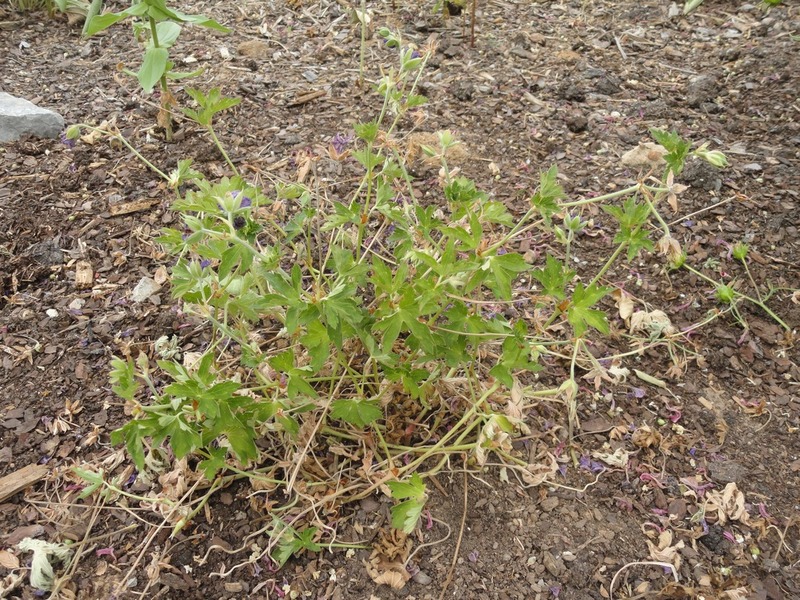 It must be difficult watching your garden struggle and wondering what is the best way to help it. I applaud your vision to incorporate local wildflowers into your garden as a solution. I've given up chasing after high-maintenance plants that require endless efforts to keep them alive and go for the hardy, disease-resistant, you-can-count-on-me varieties, many of which grow along the highways and ditches around where I live too! Good luck with your garden and I hope it rains soon. Thank you for the support, Rosemary. We did have one night of rain this past Sunday that has perked things up considerably. It's amazing how one not-so-substantial rainfall can have such a rejuvenating effect on the garden! Plants that I had given up for lost like Pineapple Sage and many of the zinnias have come roaring back!! 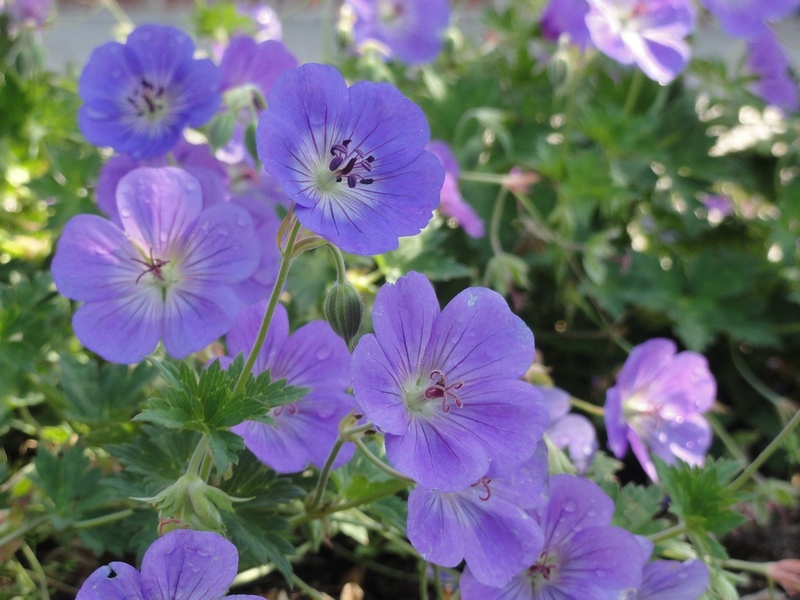 Hi Aaron, My three 'Rozanne' geraniums are one of the few plants blooming in my garden right now. I live in the hot interior valley of CA and they have been little troupers. We get no rain in the summer months but have a sprinkler system. I also have them planted in the east facing beds. Last year they were in a too shady area so I moved them. They died down in the winter but popped up raring to go this spring. (Thank you for visiting my blog! My Red Hot Poker hasn't produced any more blooms. I think it's still getting adjusted to being transplanted. The foliage has a grassy (weedy?) look about it, but the flowers are worth it. And my poor 'Ring of Fire' sunflower was eaten by slugs or snails! Hope you are having a cool down! @Dorothy - Thanks for the comment! I have plans to add more geraniums this fall or next spring (any opinion on which is the better time to add perennial geraniums to the garden?) but this time I'll be giving them some partial shade on the East or North side of the house! Hopefully they'll do better there. I feel your pain ~ the heat & lack of rain has been a big issue here this summer as well. Usually Colorado summers are pretty pleasant but this year is just plain HOT! Glad you are keeping some things alive ~ looks like the pollinators appreciate it. You asked about the artichoke ~ I've tried to grow them in the past without luck but I think the problem was not enough sun (my raised bed container is in partial sun). This year I planted in a different site ~ full sun ~ & that seems to be the answer. Otherwise supplemental water. My niece is going to be thrilled. Thanks for the comment, Kathleen! A bit of research online turns up something from UC Davis saying that artichokes do best in areas with cool, foggy summers. But I say real-world experience is the real proof in the pudding, so I look forward to hearing how your 'chokes perform in Colorado! Keep us posted on the artichokes' growth and hope you get cooler and more pleasant weather soon! !